If you are on a budget, and still want a 3-Row family hauler under $30,000 check out the Mitsubishi Outlander. The small SUV offers three-row seating, all-weather-capability, lots of features, and extra safety equipment for growing families. This week we drive the 2018 Mitsubishi Outlander 2.4 SEL S-AWC model. Mitsubishi Outlander adds some safety equipment and aesthetic touches in the middle of the lineup. 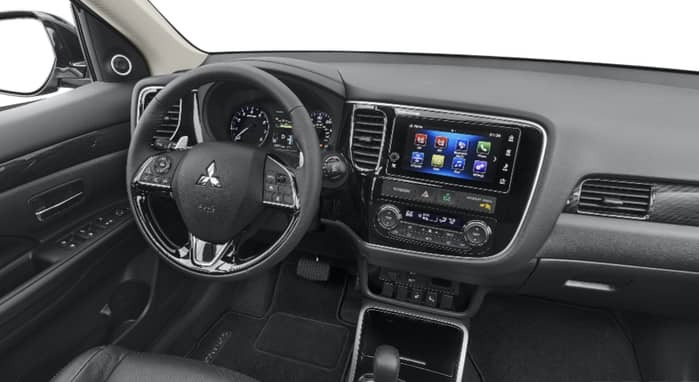 The 2018 Mitsubishi Outlander SEL S-AWC ($27,995) comes with foglights, body-colored side mirrors with integrated turn signals, keyless ignition and entry, an electronic parking brake (all-wheel drive only), heated front seats, and an upgraded audio system with satellite radio, and Apple CarPlay and Android Auto smartphone integration. The SEL also features automatic headlights, power-folding mirrors, automatic wipers, gloss-black interior trim, a power liftgate, blind-spot monitoring with rear cross-traffic alert, leather upholstery, an auto-dimming rearview mirror and a power driver seat. The SEL Touring package ($3,000) added LED headlights and LED fog lights, a sunroof, a heated steering wheel, a 360-degree parking camera system, and a nine-speaker Rockford Fosgate audio system. It also came with automatic high beams, adaptive cruise control, a forward collision mitigation system with automatic braking and a lane departure warning system. Total MSRP including destination: $32,060. Stepping inside the Outlander SEL revealed comfortable leather-trimmed seats and plenty of soft-touch materials throughout the cabin. The front seats are supportive with lower cushions just long enough for tall people, and outwaexcellent.ty is excellent. Unlike many crossovers in this class, the second row doesn’t feel flat and hard, and it’s comfortable enough for adults. The second-row seats fold in a three-step process: Flip the headrests forward, lift the lower cushion and place it against the rear of the front seat, and flip the seatbacks forward. You can’t slide the second row fore and aft, as you can with some other three-row models. Both the second and third rows fold flat, creating a very useful cargo floor with a low load height. There are small side boxes just aft of the wheel wells, plus a small under-floor storage compartment that can hide a laptop. The Outlander's base engine is a 2.4-liter four-cylinder engine (166 horsepower and 162 pound-feet of torque) paired with a continuously variable automatic transmission (CVT). EPA fuel mileage estimates come in at 24/29 city/highway mpg and 26 combined mpg. 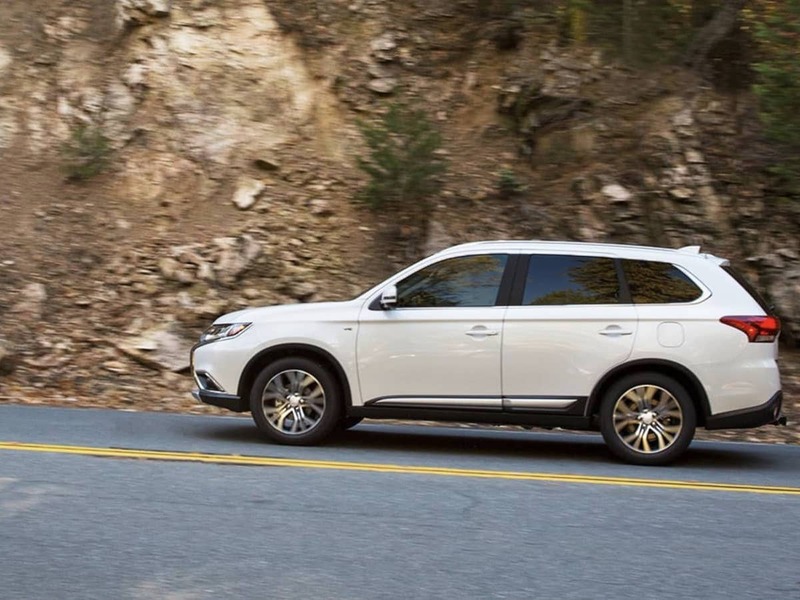 The Mitsubishi Outlander is an undemanding crossover that’s quiet, comfortable, and well-mannered on the open road. It can seem a bit soft and detached from the driver, and the 2.4-liter has enough power for most driving situations. We pushed it hard going up I-70 at 9,000 feet elevation and it held it’s own while hauling two people. Add a full complement of kids and gear and it will struggle, however. If you drive in the city, which most families will, it will supply your needs well. Families who want the security of all-wheel-drive will benefit from Mitsubishi’s many years of rally racing where they perfected the system. The system is called S-AWC, which sends the optimum torque split in every situation, including when just one wheel is on ice. We were able to test the SEL on a dirt trail in the mountains and we felt confident in the Outlander’s ability to get us anywhere safe and secure. Even though the optional electronic safety lane-departure warning is a bit annoying, it worked almost too well as we traveled the two-lane mountain roads. It also features a forward collision mitigation system that notifies the driver if you are following a vehicle too closely. If the driver fails to react, it automatically applies the brakes to reduce the severity of an impact. If you need an affordable 3-Row seven-seat family crossover, the Mitsubishi Outlander SEL S-AWC gives you a good bang for the buck. If you need all-wheel-drive, Mitsubishi has one of the best.